Get Started on the Right Track with Your ELLs & A Back-to-School Activity! All Grade Levels of Engagers are Here! If you’re a teacher, we know fitting everything into a packed school day can be tricky. If you have English Language Learners in your class, you also need to enhance their English while teaching the mainstream curriculum. The practices we have in our lessons work well with all students, including ELLs. This is why we received the California English Language Development Endorsement, even though we are not specifically a speech and language program. You can read more about that here. The ELL population is growing faster than the total school population. 85% of ELLs start school in the US in the lower grades. ELLs are being taught primarily in the mainstream classroom by general education teachers. In the WriteSteps lessons, speech and language are being taught naturally during writing instruction with modeling, planning, turn and talk, brainstorming, partner work, conferencing, and sharing. 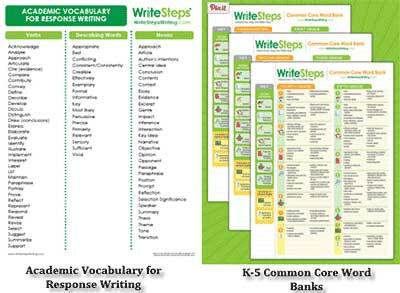 Our K-5 Common Core Word Banks cover the words and phrases used in the Common Core State Standards for writing. Use them to familiarize your students with the high-frequency academic language they will see often. Response writing is also crucial for next-generation assessment success. Here’s an academic vocabulary poster to help you use a variety of terms when creating prompts for response writing. Varying your terms (e.g., writing piece, passage, excerpt, selection) will help all students understand what is being asked of them. We’re thrilled to announce EngagersTM are now available for all grade levels at only $99 per teacher. Engagers are our SMART Notebook interactive whiteboard lessons that teach every eWriteSteps lesson. Engagers work correctly only on a SMART interactive whiteboard (IWB). It was always our intention to create Engagers so any teacher, regardless of what type of IWB they have, could use them. Below you will see our timeline on the Engagers project. We were very disappointed that SMART pulled their free software. If you’re interested in using Engagers, and you don’t have a SMART interative whiteboard or SMART Notebook software, check with your tech support about purchasing through SMART Technologies. For further information, and to watch a video of Engagers in action, click here. 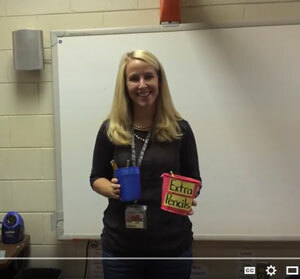 Last month’s Inspired Writer blog featured this back-to-school activity pictured on the right. If you missed it and would like a copy of Get to Know Your Classmates. Have your students complete this activity during the first few weeks of school. It helps break the ice, eases those nervous butterflies, and sets a welcoming tone in your classroom. While you’re there, don’t forget to subscribe to our Inspired Writer blog, so you don’t miss posts like this one! PD On-Demand is a set of videos that can be viewed individually, in PLCs, or in a staff meeting. Once purchased, a video can be watched at any time by anyone who registered for their eWriteSteps subscription using their school’s access code. Learn more about PD On-Demand here. I’m sure there’s quite a few of you who can relate to this one! Do you have a funny student writing piece you can send us? If so, send them to [email protected] to be featured in an upcoming eNewsletter! Erin Castello, a first grade teacher, shares how she resolves the broken pencil dilemma in her classroom by creating a simple daily routine that saves valuable instructional time. You’ll eliminate students hanging around at the pencil sharpener! You might also consider recruiting a student or parent helper to sharpen pencils at school or home once a week and return them to you. You’ll always have a fresh supply. WriteSteps Welcomes Michele Hamer to the Team! Michele is the North Carolina Educational Consultant that works with administrators, teachers, and district decision makers to help with the sale and implementation of WriteSteps. Prior to joining the team, Michele was an elementary teacher for almost 20 years. After her time in the classroom, she entered the educational sales arena as a representative for Study Island. 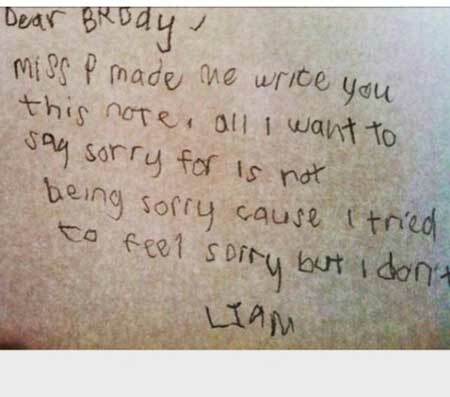 She then became an advocate and consultant for Handwriting Without Tears. 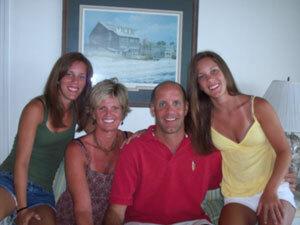 Michele enjoys spending time boating on Lake Norman, gardening, and camping at NASCAR races with her husband, Mike, and their adult twin daughters, Lauren, and Ashley. As a native of Pennsylvania, she is a dedicated Phillies fan. If you’re attending the NJ/PA ECET2 Convening, don’t miss our presentation, “Unlocking the Door to Common Core Writing Success.” Emil Carafa, the principal of Lodi Elementary, will introduce two of his teachers, Caitlyn Ferreira and Dana Breitwieser, who will be presenting. Stop by the WriteSteps booth at the Georgia Association of Curriculum and Instructional Supervisors Conference and say hello to Marilyn Massey. She will be able to answer any questions you have about WriteSteps. Copyright © 2015 WritingCity, All rights reserved. Please us on Facebook for tips, tricks and free stuff!